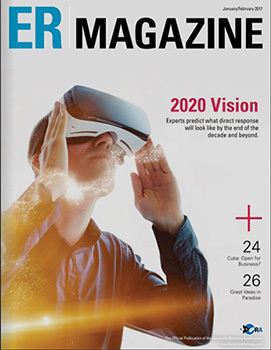 In the latest issue of ER Magazine, Senior Editor, Ian Murphy, spoke with multiple Direct Response experts and asked them to look into their crystal balls and tell readers what they expect DR to look like three years from now and beyond. • What will DR fulfillment look like by 2020, and how does that differ from what we see today? • If we ask the same questions of the decade that follows, what other changes do you see ahead? Our world moves so fast that it’s hard to predict 4 years, much less a decade, but I think that innovation is going to influence a couple of areas significantly over the next 10-15 years – workforce automation and transportation. We’re seeing a lot of new trends in workforce automation, like the Internet of Things and drone delivery that I think will take time to develop and adopt but certainly will help control costs on the fulfillment end. Also, there’s transportation to consider. Uber is already introducing delivery options and testing in major markets. There’s also self-driving vehicles that are going to continue to evolve and move into the carrier realm.